Former Newcastle United striker Michael Chopra has been drafted in the first-round of the Indian Super League International Player Draft, signing with Sachin Tendulkar’s Kerala Blasters. Chopra, an English footballer of Indian origin, played in the English Premier League with the likes of Sunderland, Cardiff City and Ipswich Town, while also representing England at youth level. Unsurprisingly Chopra was snapped up quickly in the first-round of the ISL draft, given his star-power in Indian football, and impressive record abroad. Chopra has made over 300 club appearances in his English club career, scoring 105 goals along the way. He also made his UEFA Champions League debut in 2002 with Newcastle as a substitute against Barcelona. 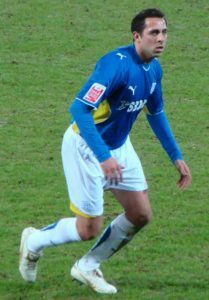 Chopra broke several records during his time in the English Premier League, including scoring a then-record fastest goal by a substitute player in the EPL, after only 15 seconds on the pitch. He also found fame in India for being the first player with Indian heritage to play and score in the English Premier League. Given his scoring record and popularity with fans, Tendulkar and Kerala Blasters will be thrilled with the signing of Michael Chopra, who looks to possibly be one of the most dangerous strikers in this years Indian Super League.